Calendar invitations have been a great way to get everyone on the same schedule since the 1990s. They used to be simple - you used them within your company, from your standard desktop computer running Outlook. You invited people within your company to meetings and events, you were all on Exchange, and maybe even invited conference rooms to reserve them. Things were pretty rigid and standardized, mostly in a good way. Nowadays you might need to coordinate people across several companies for a meeting. They might be running Outlook on a PC, Thunderbird on a Mac, GMail/GCal on some flavor of Linux, or many times multiple clients including a mobile OS like iOS or Android. Calendar invitations are being generated by all these email/calendaring clients, automated processes, and online cloud services like WebEx, and many other sources. It is important to understand how your invitations will be consumed, and to adhere to some best practices for maximum effect. I am going to mix in some opinion as well, YMMV, take it with a grain of salt. Mobile invitations often leave a lot to be desired. Orange rectangle shows "View In Calendar" - which does NOT always work to show you when the meeting is. Many times I am left guessing when a meeting is and I can't accept it from mobile. I have to then mark the email with a flag/star and remember to look at it when I get back to a desktop. Red rectangle shows use of a substandard conferencing system. Use WebEx, Join.me, or another paid-for conferencing service for screen sharing. I have not yet seen repeatably reliable screen sharing from the freebies. Do not risk sounding bush-league on your conference. Pay the ~$170/year to get a good screen sharing service. Yellow rectangle shows a phone number with periods.in.between.the.npa.nxx.etc. Don't do this. Format phone numbers as (781) 487-7800 or 7814877800 so that mobile devices can interpret them and make them "clickable" to call them. Very helpful if someone is dialing in from the road. Grey rectangle shows a 9-digit pin. Make PINs short IF you have control over them, I recommend 4-5 digits. Green rectangle shows a short pin - this is good. If someone is dialing in from the road they might be able to memorize the pin, click on the phone number to auto-dial it, and then enter the pin and join the call. If you have a long pin and they are on a mobile, they will have to task-switch between Phone and Calendar to try to get all those digits right. Very clunky. No way to change details easily - what if I am running late? Or I need to postpone one of these meetings? I have to look in the invite list, figure out who the people are, dig up their contact info, and call. Or reply-all on the meeting invite (if that is possible) - and on a last-minute change people might not get the email in time. Assume that 66%+ of the time, your invite will be opened on mobile first. Time and date of the meeting MUST be in text inside the body of the invite, as well as in the date field of the header. Help mobile clients know when your meeting is happening! Use a conference bridge for EVERY scheduled call! See my related blog post on this, "How to coordinate like a pro: Conference bridges." Phone numbers should be well-formatted. Use Short PIN numbers if you can control them. Locations should be well-formatted and GPS-capable. 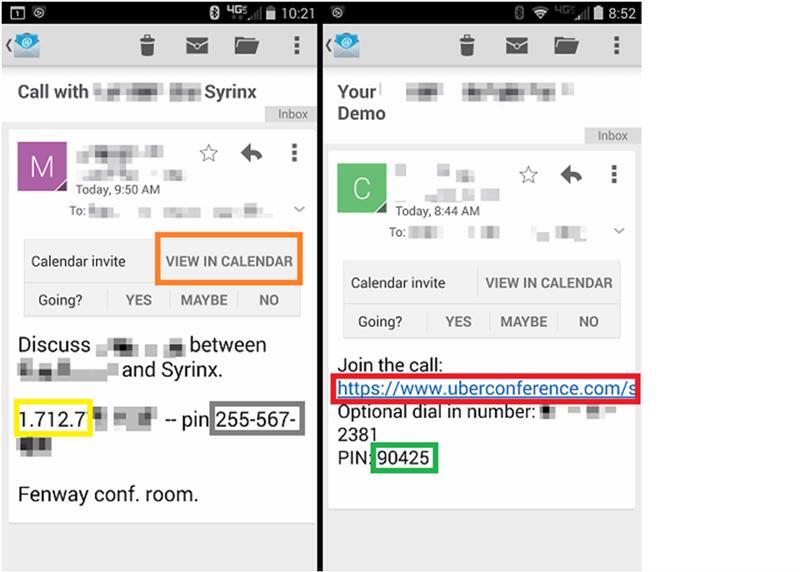 If you have suite numbers/conference room names/other things, include those in text in the BODY of the invite, not in the location field of the invite. The location field should be something a GPS can read like "160 Gould Street, Needham, MA 02494" not "160 Gould, Suite 116, Needham" or "Headquarters" - Help the mobile device help the user! Include cell numbers for any last-minute changes. Why call (and not email/text) for last-minute changes? See "How to communicate like a pro: 5 tips for choosing the best communication method." If you would like to include documents, try using Dropbox links, Evernote share links or another online sharing method instead of attaching them directly to the invite. Some clients do not handle the invite attachments well. Keep embedded links short. Use bit.ly or other shorteners if needed. Avoid having your giant URL accidentally cut off. Truncated URLs are broken URLs. Mark required people as mandatory attendees, and everyone else optional attendees (if your calendar client allows this). Give people an "out" if they are over-scheduled already and do not truly NEED to attend. Include a short bulleted agenda for everyone to follow in the body of the invite. Think about your attendees' time zones when scheduling. Agree to a time and make the meeting in your time zone. Their clients will adjust the time offset in the other time zones. Your mobile client should auto-adjust the meeting times if you cross time zones traveling. Recap the meeting afterwards with a quick email to everyone. Quick bullets on what was said and agreed to. 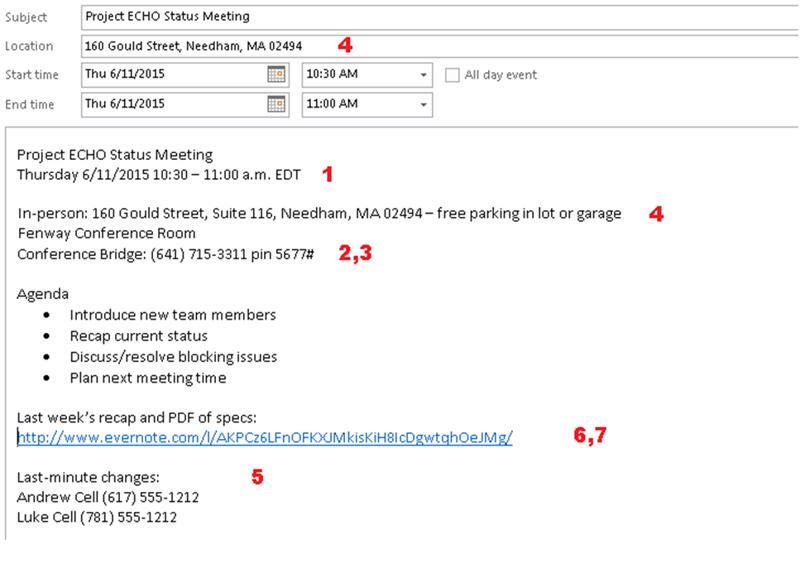 Even better than email - document the meeting using a tool like Slack, SharePoint, Evernote, etc. Is the default notification time of 15 minutes before enough? Do you need more time to travel, break free from an adjacent meeting, etc? Maybe make the notification time an hour or more. If people are traveling to your meeting, help them with parking and/or commuting tips in the invite. If you find yourself doing this over and over, make a web page or Evernote and share the link at the bottom of your invites. Much of my advice is United States-centric, where everyone has access to phone conferencing, and 011 + country codes are not required for international dialing. Apologies in advance to folks in other countries, your mileage may vary. Some of the items above are from my personal pet peeves/opinions of how things should be. You may have different tolerances/ideas.